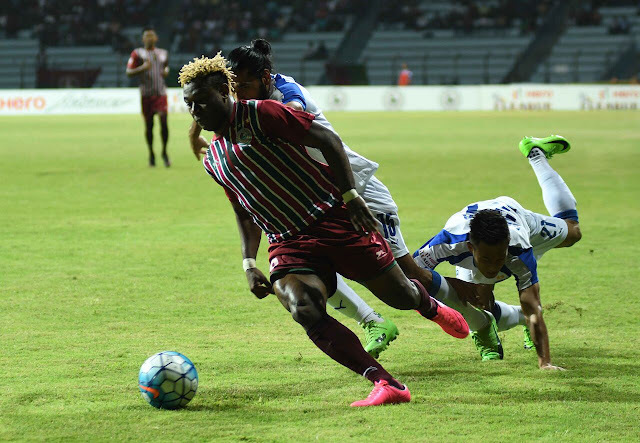 Mohun Bagan breezed past Bengaluru FC in the Hero I-League fixture played at the Rabindra Sarobar Stadium, Kolkata. Katsumi Yusa scored a brace with Darryl Duffy also registering his name on the scoresheet. Sony Norde was a livewire causing big problems for Albert Roca's struggling defense. It was Norde who assisted Katsumi Yusa for the opener when the Japanese midfielder was allowed space and time to fire a grounder towards Amrinder who failed to stop the ball cross the line despite getting a hand. Norde was the architect again for the second goal when from a dead ball situationm the Haiti International curled in a dangerous inswinger which was headed home by Duffy who rose highest. After the half time break, Norde kept on running the show. Bengaluru FC were made to chase Norde's shadow when the winger made a darting run from his own half leaving defenders for dead before setting up Katsumi whose delightful finish sealed Mariner's victory. That was Katsumi Yusa's second goal and Mohun Bagan's third and final goal of the match.